I have always been a fan of Toubab Krewe ever since my first time seeing them live at the Ark in Ann Arbor, Michigan in 2008. Their unique sound and virtuosic jamability immediately drew me to their music. Directly after the concert, I purchased their new album at the time “Live at the Orange Peel”. Ever since purchasing and exploring this album, I had been hoping to see the band come out with some new material; and here it is fresh and hot off the presses. “TK2” is a musical voyage across soundscapes that are exceptional and expressive for a small jam band. Throughout this new album we are given a taste of some eclectic sounds from across the world. 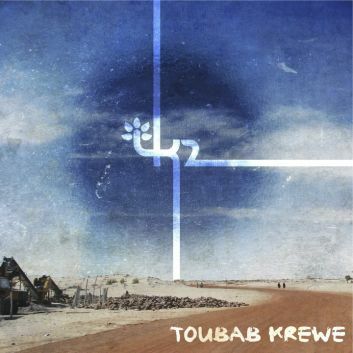 Up until this album, Toubab Krewe seemed to rely heavily on an African and southern rock fusion sound. However, in this new album Toubab dives into realms of musical influences that stretch from 60s garage psychedelic rock to Spanish flamenco music. In tunes such as Konkeba, one of my favorites on the album, we hear a wide blend of cultural sounds that include a basic African rhythmic intro that is tremendously percussive and full of cyclic grooves. Another dynamic tune, Carnavalito, has a heavy Spanish influence that brings a whole new light to the diverse sound of Toubab Krewe. From the Spanish rhythmic feel to the intricately played Kora part, this tune has a heavy drive to it that pushes the song to a climatic peak leaving the listener wanting more. I can easily see this tune becoming a regular favorite in the band’s live repertoire. As soon as you pop in the album, you can hear a new musical direction the band taking. Right after a catchy Klezmer into, the listener is captured by the sound of a keyboard. This has been unprecedented in any previous sound of the band. The spellbinding playing of the keys in Mariama backed by a hypnotic cyclical groove provided by the rhythm section invites the listener to explore a new sound of Toubab Krewe. TK2 is also full of tunes that have been a part of Toubab Krewe’s live repertoire for quite a while now including Nirvana the Buffalo, Sirens, and Area Code. This album is also packed with new tunes that both hold the unique sound of Toubab we all have come to know and love, and combining tasteful use of exploring previously unused instruments. The use of the keys in a couple of tunes including Holy Grail and Mansani Cisse gives a mysterious flow to the music. Despite the new sound being brought to the table, the band uses the elements tastefully to not only spice up their music but allow the album to flow. In Holy Grail the heavy keyboard influence along with the bass and guitar allows to convey a very dark and mystifying 70s psychedelic rock sound. One of my favorite tracks off of the new album has to be Give Fare. This tune is ripe with a heavy rock sound as well as a driving African percussion part. The intro and outro has a late 70s, early 80s rock and roll sound as if it were something David Bowie wrote. As the tune progresses the familiar sound of Toubab Krewe creeps up through the guitar tones as the percussion begins to drive the piece of music to a whole new realm. Suddenly, a percussive breakdown ensues and an upbeat melody takes over driving the tune to the utmost climax. This track represents to me the pinnacle of this album, the ultimate fusion between this new sound Toubab Krewe is discovering for themselves, as well as their familiar ability to explore and peak out a jam. All in all this album left me surprised, intrigued, and even more in love with this extremely talented band. In my opinion, Toubab Krewe’s ability to reach beyond the generic influences that most jam bands come to identify with and explore the realms of world music, puts them in a higher light than just the jam band scene. These musicians are on a whole other level in not just their jamability but their vision of music as a consistently evolving organism that mustn’t be kept in one medium. TK2 takes us to the ends of the earth and back by exploring sounds from cultures unfamiliar to the everyday music listener. The album ends with a beautiful 10 minute jam entitled One Night Watkins that truly demonstrates their ability as a band to improvise as a group and leaves you wanting to catch these guys live, even if you’ve seen them dozens of times before.